Normanview Mall owners will miss out on business because they think Riders fans won’t shop while parking there. The SaskParty’s spectacularly bad move to end the inter-city bus service STC keeps getting worse. The international bus line Greyhound has moved their service out of Regina’s downtown, into the airport. This might not have been such a problem, except there is no public transit bus (or even a private one) to the airport! So a bus rider is forced to walk an unsafe long route, bum a ride, or use an expensive cab to use the ‘affordable’ Greyhound inter-city bus. Waschuk hopes Greyhound will expand its presence at the airport. Likewise, he’d like to see city bus service to the airport — although that is unlikely in the very near future. Brad Bells, director of Regina Transit, said city bus service to the airport is “on our horizon,” but unlikely to occur in 2018. Regina Transit’s next priority is an Arcola Express bus, connecting downtown to southeast neighbourhoods like Greens on Gardiner. Waschuk said the airport’s tenants and prospective tenants have been wondering about bus service for their employees. “There’s 1,000 people in the airport campus out here, counting all the buildings and tenants. … That number’s going to continue to grow,” said Waschuk. He also sees bus service as valuable for Regina residents in general, including university students and seniors. “I remember my own daughter when she was at university in Saskatoon, she took the bus to the airport all the time for economic reasons,” said Waschuk. It’s a grim situation for people who don’t drive cars when only 1 in 3 Regina MPs cares about the problem, and 1 of 11 on Regina City Council wants to see a bus to the airport. How Far Does a Regina Transit Bus Go? During the weekday, the longest run is 415 km. The average is 240 km. Regina offers a discounted pass, but nothing like this Calgary program. Demand for Calgary’s new $5.05 monthly transit pass has exceeded expectations, with nearly 40,000 of the steeply discounted passes sold to Calgarians living in extreme poverty during the program’s first three months. …Melanie Hulsker, manager of strategic services for Calgary Neighbourhoods, said the pass numbers are already higher than projected and demonstrate there was a need in the community for the program, which is believed to be the first of its kind in Canada. Staff who sell the passes have heard a range of stories from Calgarians happy to have access to transit for $5.05 a month, including a woman who said the initiative has allowed her family to finally travel places together. The progress of a city is not assured by the passage of time. Regina has unquestionably progressed in some areas of life, and unquestionably regressed in others. The following is an incomplete list. 100 years ago, chickens were allowed to roam free. Now, the City prohibits them even in a backyard. 60 years ago, Electric Vehicles were common on some Regina streets, in the form of streetcars. Now, only a few dozen or so EVs are in the city, as electric bikes, cars, and SUVs. We also had a bus route to the airport, but no bus is available to the airport today. Also 60 years ago, we allowed toxic waste dumping into our soil and groundwater, all over the city. Now that’s only permitted at the landfill. 28 years ago, you could leave Regina by STC bus, or by Via Rail train. Now, in 2017, neither of those modes of transportation are an option due to government cuts without environmental reviews being undertaken to guide those bad decisions. 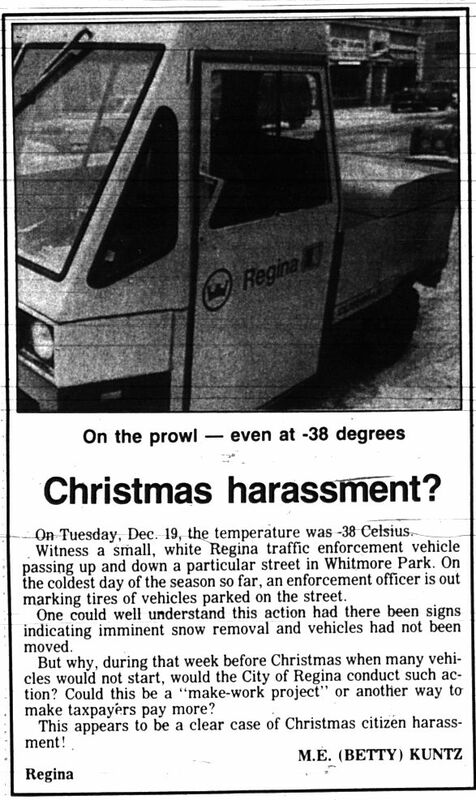 27 years ago, Parking enforcement used sensibly sized vehicles. Now they use GMC gas burning SUVs.